Two Diamonds: As shown in fig. 37, the frame strings arise from the near index and far little finger strings of the loom (the black strings), whereas the strings that form the diamonds arise from the far index and near little finger strings (the white strings). One Diamond: Again the same. Three Diamonds: Again the same. Four Diamonds: Again the same. There doesn’t seem to be much happening here except the division of the circle into frame one color and complexity another. But suppose we were to further divide the circle into eighths, with each band of color defining a 45 degree arc (fig. 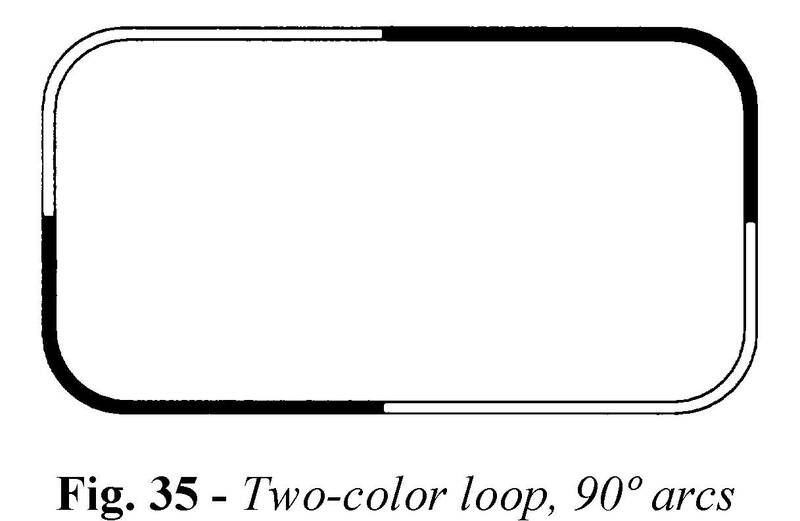 38), then weave the four basic figures using a two-color Double Katilluik Loom (fig. 39). What would happen then? 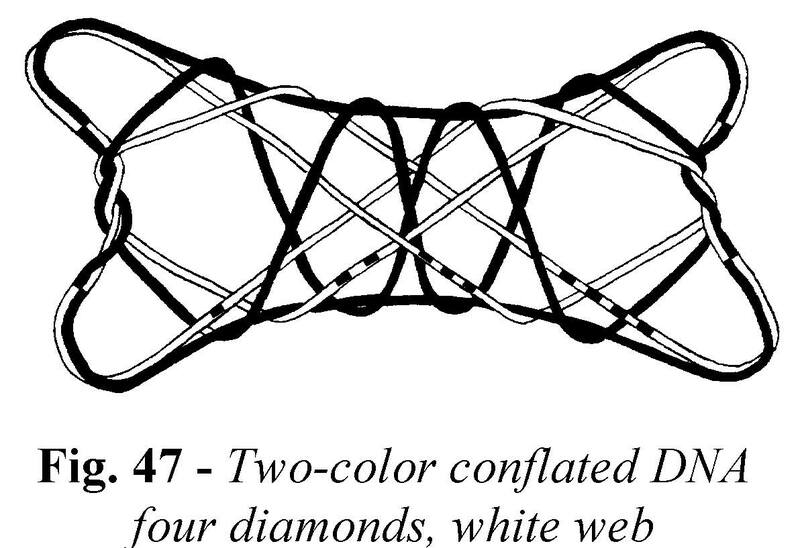 Two Diamonds: Again the framework (which now consists of double strings) is black and the “complexity” is white (fig. 40). But there are more things happening here than you might at first guess. We need a method for identifying where each of the white segments of the circle end up in the final design. One way of addressing the problem is to number the white segments consecutively around the circle with one stripe, two stripes, three stripes, and four stripes (fig. 41). 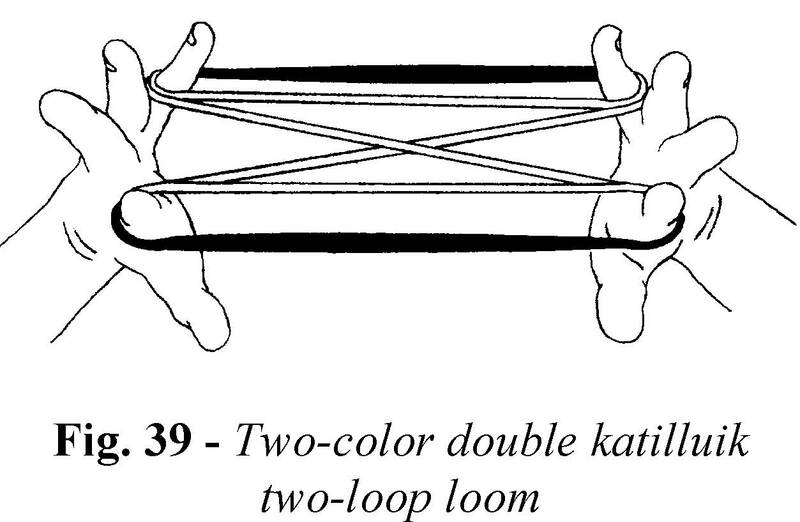 Now set-up the Double Katilluik two-loop loom so that the white segments form the interior strings and the black segments form the double near index and far little finger strings. Try to make the “1-stripe” string be the transverse on the far side of the index, the “3-stripe” string be the transverse on the near side of the little finger, and the “2- and 4-stripe” strings be the strings that cross in the center (fig. 42). Other configurations are certainly possible, but for the moment try this one. 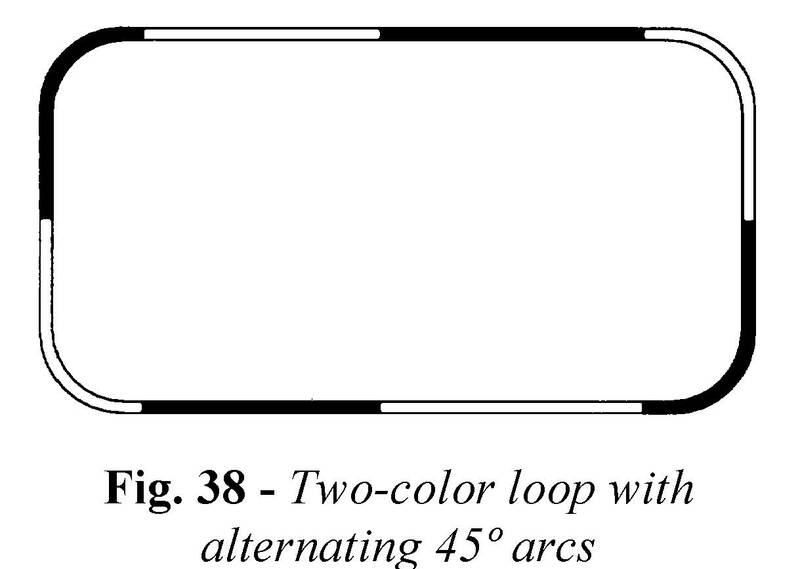 Also, make sure that when placing the loop on your hands in Position I, the numbered segments increase in value as you proceed clockwise around the loop when viewed from above. If you don’t adhere to this convention, much of the ensuing discussion will not make sense. 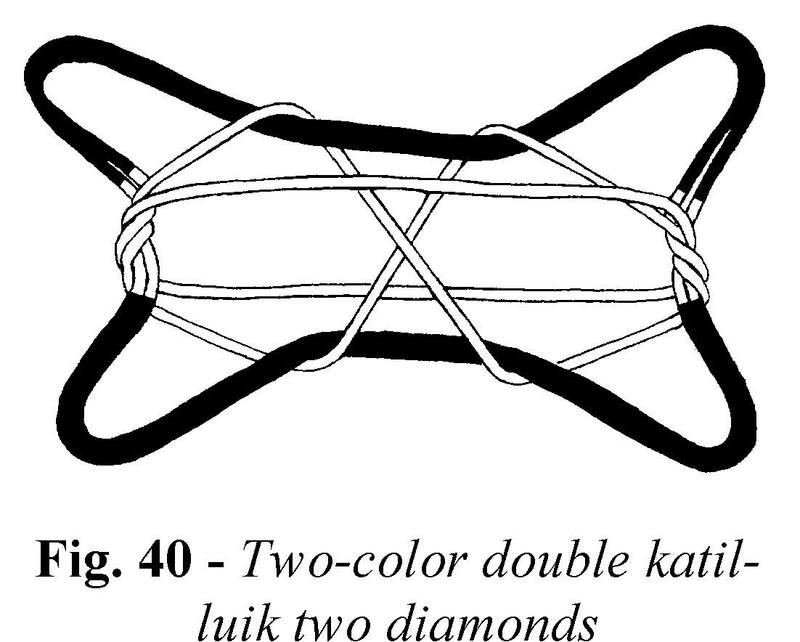 Now, form and examine the Double Katilluik Two Diamonds figure. You will notice that the two central transverse strings are the 1-stripe and 3-stripe strings while the crossing “complexity” strings are the 2-stripe and 4-stripe Two-color double strings. This is somewhat surprising! Next, conflate a DNA four-loop loom into a two loop reality. Shift the segments until the white 1-stripe and 4-stripe strings criss-cross between the index fingers, and the 2-stripe and 3-stripe strings criss-cross between the little fingers. Now the figure formed upon applying the Osage Two Diamond weaving and extension phases has black strings forming the two diamonds and white strings forming the “web” superimposed on them, with the 2-stripe and 3-stripe strings crossing on the front side of the figure and the 1-stripe and 4-stripe strings crossing on the back side (fig. 45). Things are not as simple as before! 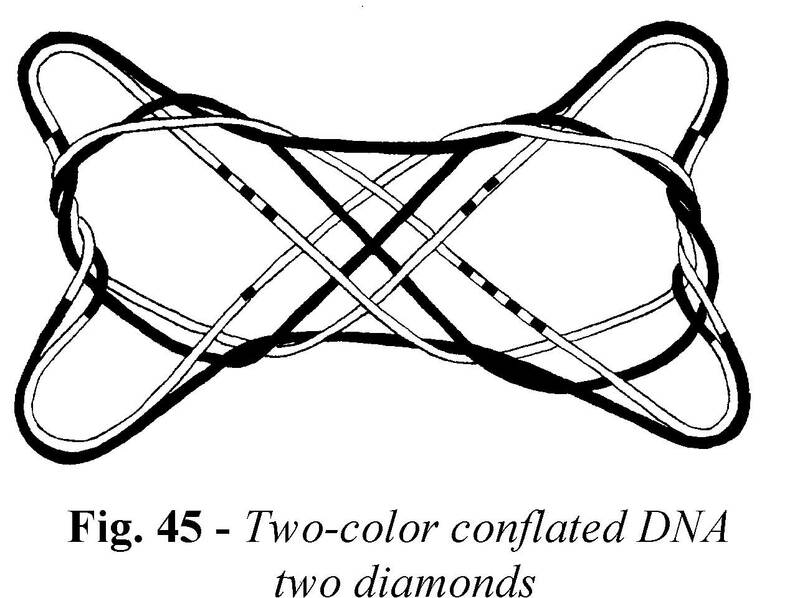 Let’s skip the One Diamond and Three Diamonds figures for a moment and move directly to investigating the Four Diamonds figure with the Double Katilluik and Conflated DNA geometries. 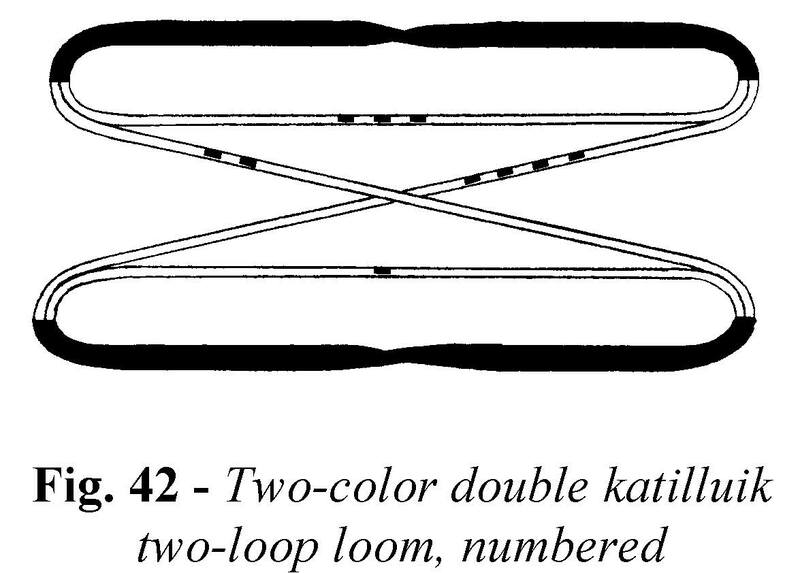 With the Double Katilluik two loop loom the Four Diamonds weaving sequence produces a figure with the four diamonds formed by the 2-stripe and 4-stripe strings, and the double transverse strings in the center formed by the 1-stripe and 3-stripe strings (fig. 46). 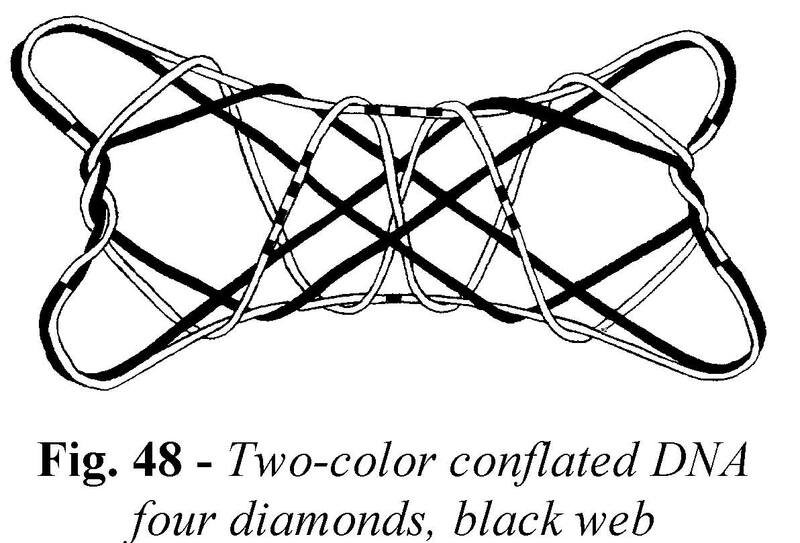 With the conflated DNA four-loop loom the four diamonds weaving sequence produces four diamonds formed by the black strings and a web formed by the white (striped) strings (fig. 47). If you examine the striped strings from left to right as they intersect with the top framework string, their order is: 3-4-1-2. If, by accident, you placed the loop on your hands in Position I so that the numbered segments increase in value as you proceed counterclockwise around the circle, their order in the final design would be 2-1-4-3! 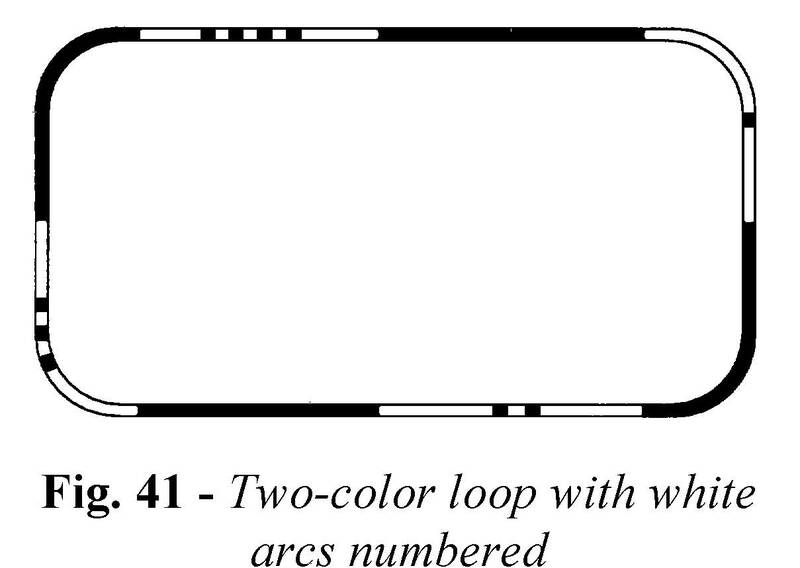 In fact, the outcome can be predicted by noting the identity of the 1-stripe and 4-stripe strings in the conflated DNA four-loop loom: if the 1-stripe string travels from the near side of the left index to the far side of the right index, then the order of the strings in the final design will be 3-4-1-2, implying that the numbered segments increased in value as you traveled clockwise around Position I. But, if the 1-stripe string travels from the far side of the left index to the near side of the right index, then the order is 2-1-4-3, and the values increased in a counterclockwise direction. If you are wondering what is happening with the non-web strings, you can arrange the conflated DNA four-loop loom so that the transverse near index string is the 1-stripe string and the transverse far little finger string is the 3-stripe string. 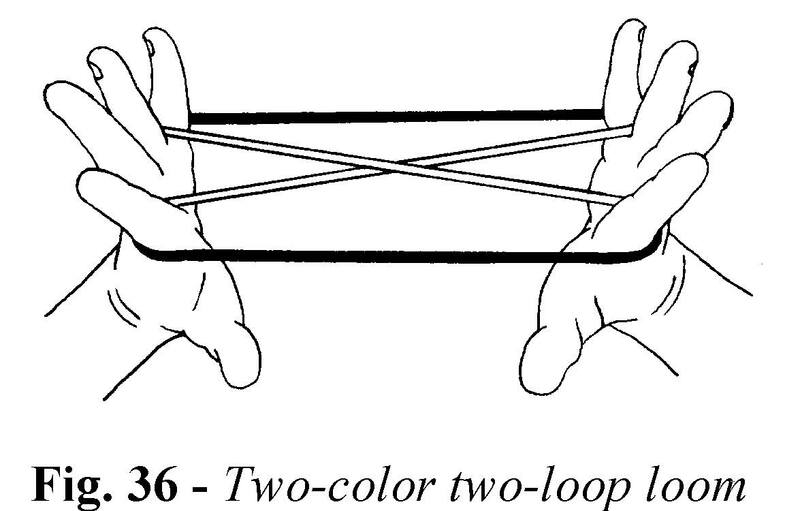 This figure, when formed with the Four Diamonds weaving sequence, has the white 3-stripe string as an upper framework (transverse index) string and the white 1-stripe string as a lower framework (transverse thumb) string. 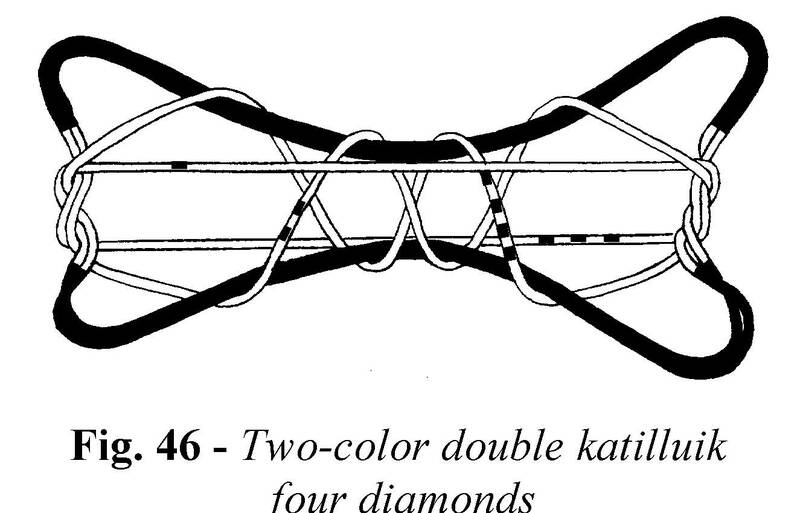 The four diamonds in the middle are formed by the white 2-stripe and 4-stripe strings (fig. 48). i would call your attention especially to the pattern formed by the + + combination. In this design, the intersecting strings of the two central diamonds (white 2-and 4-stripe strings) are locked within the quadrilateral created by the black web strings where they criss-cross in the center. i also ask my students to consider the consequences of twisting the four loops of the DNA four-loop loom individually, before conflating them (sixteen possible permutations of + and –). The results are again informative. Several paragraphs ago i asked the reader to postpone thinking about the One Diamond and Three Diamond figures made with the Double Katilluik and Conflated DNA four-loop looms. Their geometries are extremely interesting. 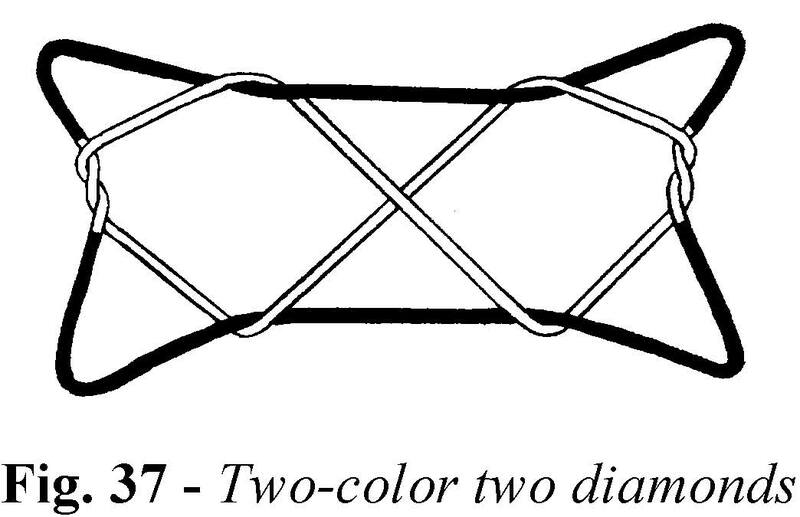 My absolute favorite is Three Dia>monds woven on a conflated DNA four-loop loom (fig. below). Here, the single upper and lower framework strings and the strings forming the three diamonds are black, and the superimposed four-string web is white. Thus you have an asymmetrical three-unit motif and a symmetrical four-unit motif in the same figure. By reversing the color polarity as i did in the Four Diamonds example, it’s possible to determine that the framework strings derive from the 3-stripe and 1-stripe strings, while the 2-stripe and 4-stripe strings form the three diamonds. The consequential topologies of the circle’s folding in on itself in this rather trivial series of figures (when thinking of what is normally done with three-loop figures, for example) make one understand what a rich and won>derful mathematics is contained in string figures. i have been exploring the more complex configurations for about a month now and am overwhelmed. My basic premise is that math is the study of the abstraction of patterns, and that the peculiar power of math lies in its ability to reduce complexity to controllable procedural patterns. The Diamonds system is a fairly simple suite of figures, the forming of which teaches a great deal about organization of effort and the particularization of differences. My three-year-old daughter learned the Diamonds system while riding with me to school each morning on the bus. You would be amazed at how quickly students will push for their own figure once they pick up speed and begin to experience success in their searching. Thus, one can “learn to learn” mathematics, and/or any other intellectual pursuit, by what a successful experience with string figures teaches. For a more explicitly modern and practical use of string figures, consider what they teach about modular thinking and, therefore, computer programming. A simple example of modularity occurs within the Diamonds system, where a module of two diamonds can be created and stored, to be added to any of several string figures. This is a perfect introduction to modern high level computer languages and their modular approach to complex programming. More advanced applications of modularity occur when new figures are created using movements borrowed from several different weaving systems. These systems, and methods of linking them, will be explored in the upcoming pages.